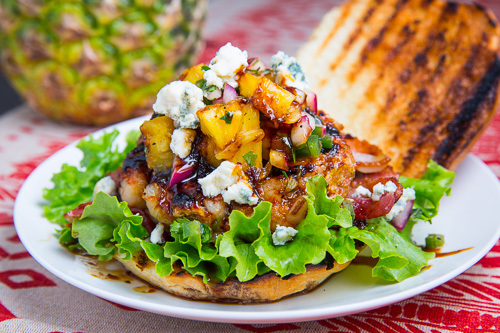 Juicy and succulent shrimp burgers in a sweet, salty and tangy pineapple teriyaki sauce topped with grilled pineapple or grilled pineapple salsa, bacon and optionally blue cheese. I have been completely enamored by homemade shrimp burgers ever since I first tried them a short while ago and since they have been on my mind a lot I had to make some more! One combo that I particularly enjoy is juicy shrimp and a sweet and salty teriyaki sauce which goes fantastically well when wrapped in bacon and grilled on skewers along with some sweet and tangy pineapple and I was thinking that a burger version would be amazing! I kept the shrimp patties pretty simple with large chunks of shrimp, a few seasoning including garlic, ginger, sesame oil and teriyaki sauce, in addition to some breadcrumbs to help hold things together. Although you could easily use a store bought teriyaki sauce it is so easy to make your own and doing so gives you the opportunity to customize it for the dish that you are using it in like in this case where you use pineapple juice. I filled the burgers out with some bacon and instead of using slices of grilled pineapple I kicked things up a bit and went with a grilled pineapple salsa . I often like to include a cheese in my burgers and after thinking about it for a while I came to the conclusion that a touch of creamy blue cheese would go perfectly well with all of the other flavours going on in these burgers! 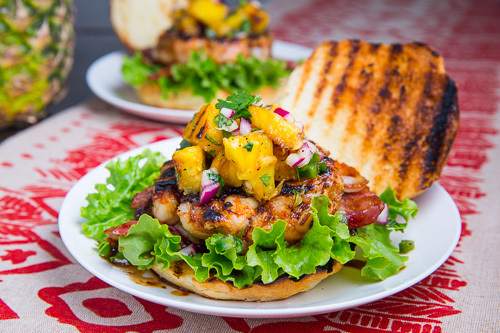 I might just have found my new all time favourite burgers in these teriyaki shrimp burgers with pineapple salsa, bacon and blue cheese and I have to admit that I made them two times last week! Feel free to keep things simple and go with grilled pineapple slices rather than the grilled pineapple salsa and you can omit the blue cheese if you are not a fan. 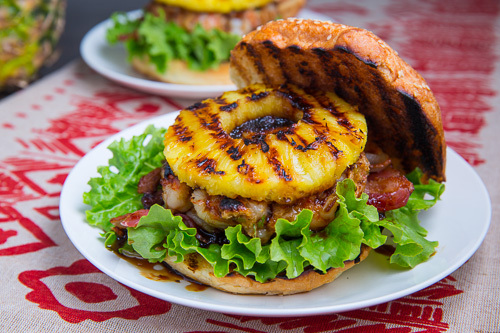 These burgers also go great in Hawaiian style sweet buns. Mince 1/3 of the shrimp in a food processor along with the garlic, ginger, teriyaki sauce, sesame oil and green onions. Mix the minced shrimp into the chopped shrimp along with enough breadcrumbs that the mixture will hold together, form 4 patties and chill in the fridge for at least 30 minutes. Oil your grill, heat to medium-high and cook until the shrimp turns pink, about 3-5 minutes per side. Assemble the burgers and enjoy! Option: Use your favourite teriyaki sauce instead of making your own. A tasty and easy homemade sweet, salty and tangy pineapple teriyaki sauce. Simmer everything over medium heat until reduced by half. Kevin, this is so my kind of burger! I love everything. the shrimp, the grilled pineapple salsa and for sure all the blue cheese! Beautiful! This is basically my idea of heaven in a burger – it looks DELICIOUS. I'll be trying soon! Great summer burgers!! Love the pineapple! That is one loaded burger! nice! What gorgeous burgers Kevin! Love! That's gotta be the best sounding and looking shrimp burger that I have seen, I have to try this on our grill. Nice post. WHAAAAAAT!???? unbelievable. I NEED these. SHRIMP BURGERS?!?! I need these. OMG. I need a pile of these! Um, yeah, so I want to a few of these. So how well did the "burger" stay together when you were cooking them? I don't see how these are bound to hold together, it is a great idea!!! Anonymous: The ground shrimp and breadcrumbs work perfectly as binders holding these burgers together very well. this burger is something i'd love on my grill out menu! You've honestly combined all of my favorite ingredients into one fabulous burger! I love burgers, and shrimps. I would have to make this for my family next weekend. Thanks for the recipe, Kevin! Oh my! These look heavenly! I have yet to try a shrimp burger, and this one looks positively scrumptious! 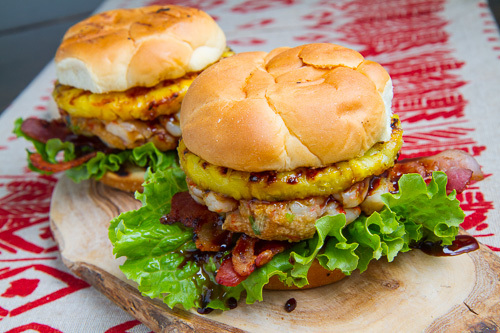 A shrimp teriyaki burger…nice twist! I'm a little wary of how my Castello Blue Cheese will taste when mixed with the teriyaki flavor, but I'll try anything once!